Use these bright 'lick & stick' labels to return any addressed junk mail with a return address to the sender. You can put addressed items back in the post unstamped. Although the labels are easy enough to use there are two things you should be aware of. Firstly, envelopes often have an orange bar code printed on them. These 'sorting stripes' are used by Royal Mail's sorting machines. To prevent the sorting machines direct the envelopes you're returning to your address again you should cross out any sorting stripes on items you're sending back. Secondly, if possible the labels should cover your name and address. Do make sure though that the sender can still find your name and address – otherwise they won't be able to take your details off the mailing list! 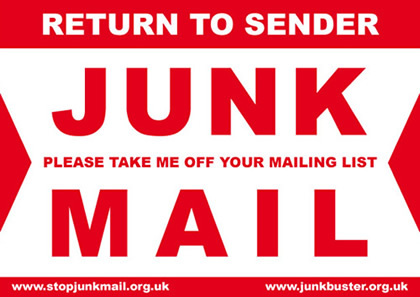 You don't need to worry about this if the junk mail came in a window envelope; all the sender would need to do to find your details is open the envelope. However, if the junk mail did not come in a window envelope you shouldn't obscure your address entirely; a single biro line strike should be sufficient.